Welcome back race fans! It was an exciting time out at your favorite short track for the 2015 Federated Auto Parts race weekend. To relive some of the best sites, sounds and stories from the Last Race to Make the Chase, check out our Race Hub below! On Saturday, September 12th, the stage was set for a 10-week battle between 16 driver nations that would crown the next NASCAR Sprint Cup Champion. The field was set in Richmond, and we're so glad to have had you along for the ride. And while the night was filled with confetti, smiles and cheers all around, eyes now turn to Chicagoland and the first race in the Chase. Matt Kenseth, driver of the No. 20 Dollar General Toyota, scored his fourth win of the NASCAR Sprint Cup Series season at the Federated Auto Parts 400 "under the lights" at RIR Saturday. 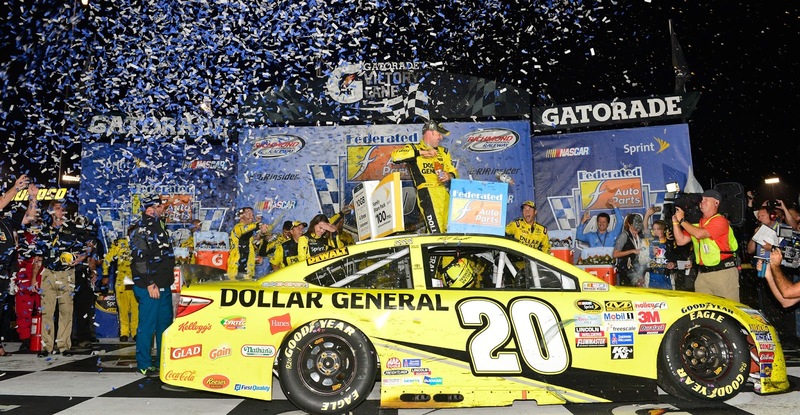 In dominating fashion, Kenseth led 352 laps tonight leading to his victory over his Joe Gibbs Racing teammate Kyle Busch, who finished second tonight. Joey Logano, Aric Almirola, and Dale Earnhardt, Jr. rounded out the top five. The victory in the "Last Race to Make the Chase" moved Kenseth to the second seed on the Chase Grid. Jamie McMurray, Jeff Gordon, Paul Menard, and Clint Bowyer raced their way into the Chase tonight at RIR. All 16 drivers who made the 2015 Chase for the NASCAR Sprint Cup took to the stage at Post-Race Party. Confetti, pyro, thunder sticks, and big heads made fans pumped up to see all 16 drivers in one place for the first time. These drivers will move on to the Challenger Round, and battle it out to see who will be crowned the 2015 NASCAR Sprint Cup Champion. • Now or Never: This is it. For those winless drivers, there’s one more chance to lock up a spot in the Chase for the NASCAR Sprint Cup. 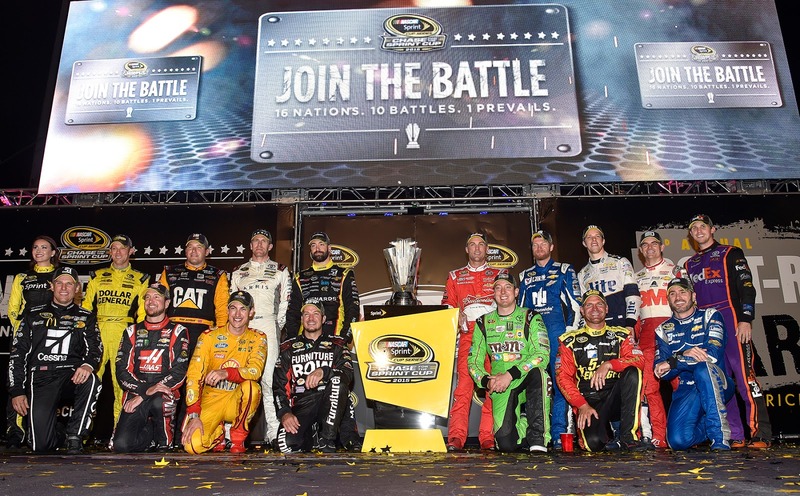 Eleven drivers already have clinched a Chase spot. For four others – Jamie McMurray, Ryan Newman, Jeff Gordon and Paul Menard – certain finishes will lock up a spot no matter who wins the race. For others, it’s likely a win-or-else proposition. • Clinch Scenarios for Richmond: Jamie McMurray will lock up his first career Chase berth simply by starting the race on Saturday. For three others, it’s a little tougher. Ryan Newman clinches with a top- 31 finish; Jeff Gordon with a top-17; and Paul Menard with a top-nine. If there’s a new winner, a Richmond win is realistically the only path to the Chase for winless drivers beyond Menard. • Bonus Points Still Up for Grabs: For those 11 drivers who have locked up a Chase spot, there’s still plenty on the line – in the form of three Chase bonus points for a victory. After the race at Richmond, each Chase driver will have his/her points reset to 2,000, with three bonus points tacked on for each win during the regular season. Currently, Jimmie Johnson and Kyle Busch, both with four wins, would enter the Chase with the most points (2,012). Chase Elliott, driver of the No. 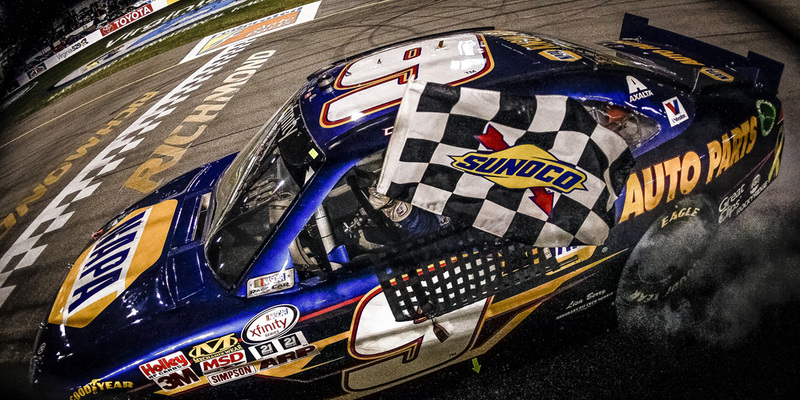 9 NAPA Auto Parts Chevrolet, took home his first checkered flag of the XFINITY series season at RIR Friday, winning the 2015 Virginia529 College Savings 250. It was also Elliott's first win at RIR, who managed to hold off a late surge from a determined Kyle Busch down the stretch. "It's been a really solid weekend overall," said Elliott. "You never know when you'll get back to Victory Lane, so we'll try to take the momentum and learn from what we did so we're even better next time." The victory marked the first time a non-full time Cup driver won the Richmond XFINITY Series event in over 10 years. It was actually Busch, race pole-sitter and runner-up, who was the last driver to do so - winning the FUNAI 250 back in May 2004. But that wasn't the only drought broken tonight, it was also Elliott's first win in 39 races. "Chase put the pressure on (himself) this weekend," said JR Motorsports owner Dale Earnhardt Jr. "He told me 'If I only won by 21 points last year then I can definitely make some things happen.'" Rounding out the top-5 were Brian Scott (No. 2 Shore Lodge Chevrolet), Joey Logano (No. 22 Hertz Ford) and Erik Jones (No. 20 Gamestop/Lego Dimensions Toyota). Josh Barry, Elliott's JR Motorsports teammate, finished 7th in just his second career XFINITY Series start. • Buescher Commands Championship Lead with Nine Races Remaining After watching his points lead dwindle for three consecutive weeks in August, Roush Fenway Racing’s Chris Buescher needed to turn up the heat at Darlington and he did just that. Buescher earned his 11th top five this season while his closest championship contender finished 15th. He now holds a 29-point lead over second-place Ty Dillon and 35 points over third-place Chase Elliott. • Virginia Natives: Sadler, McClure Right at Home at RIR Virginia is home to some of NASCAR’s most talented drivers and this weekend’s NASCAR XFINITY Series race is no exception. Local fans will have a chance to cheer on two drivers entered in the Virginia529 College Savings 250 that have their home state recorded as Virginia – Elliott Sadler and Eric McClure. • Suarez Earns Third Top-3 Finish of Rookie Season Sunoco Rookie of the Year standings leader Daniel Suarez earned his third finish of third or better this season at Darlington. The Mexico City native has posted six top fives, 11 top 10s and two poles during his rookie year in the NASCAR XFINITY Series. Austin Hill, driver of the No. 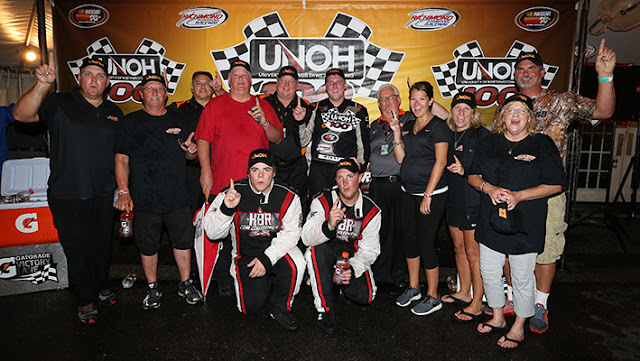 22 Ford won the rain-shortened UNOH 100 NASCAR K&N Pro Series East tonight at Richmond International Raceway. Hill, a 2015-2016 NASCAR Next class member, secured his first win at RIR, and his second of the 2015 season. This win marks Hill’s fifth victory overall in the NASCAR K&N Pro Series East. Rookie Dillon Bassett finished second tonight. Dalton Sargeant, Scott Heckert, and Spencer Davis rounded out the top five. • There are no previous Richmond race winners scheduled to compete in the UNOH 100. Three of the last four winners (Darrell Wallace Jr., Brett Moffitt and Cole Custer) are now competing in one of NASCAR’s national series. • Three of the last four events at Richmond have been won from the front row: Brett Moffitt from the pole in 2012 and Darrell Wallace Jr (2011) and Cole Custer (2014) winning from the outside pole. • This is just the third time the NASCAR K&N Pro Series East will compete at Richmond in the fall. The first two were combination races with the NASCAR XFINITY Series in 1988 and 1989. Join Us For Wellness Wednesday! Top 10 For Your Race Day!